Status – On Public Display at the Great Lakes Aquarium, Duluth, MN - Update 11-15-2015 – this fish, and its mate (GL1) were reported killed by a long time tankmate this month. GL2 is a white stripe maroon that I actually had been planning to use for myself in a Lightning X White Stripe pairing, and yes, it IS one of the nicer ones I reared. It has minimal extra markings; it’s pug face / pinched neck are not very severe, and the nick in the dorsal fin is something that I expect to fully recover (not entire sure how it happened since the fish has been isolated for months). As of 8-2-2013, this fish is off exhibit, in quarantine, in a breeder net, sharing a 29 gallon aquarium with the selected sibling mate, the Lightning Maroon Clownfish GL1. The plan is for the Lightning to be turned to the female in the pair, which risks the more “replaceable” white stripe in any mate murder scenarios. 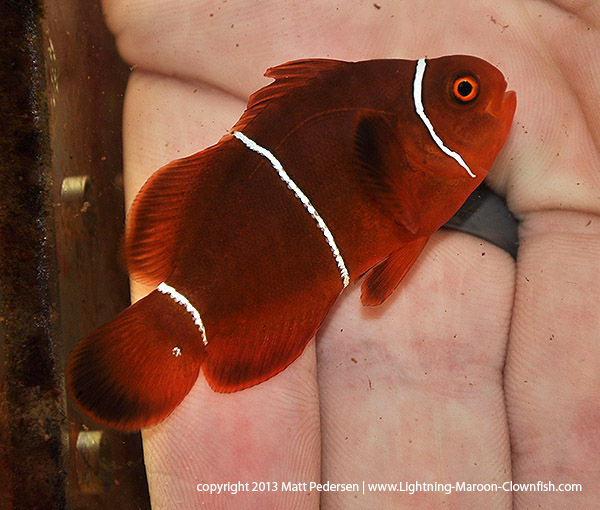 On 8-20-2014, Darin Reinke informed me that the pair had been put on public display in a small reef tank in the main lower level; they replaced a pair of Tomato Clownfish that had been on display for years. On 9-7-2014, the Duluth News Tribune ran a story about these newest fish on display at the Great Lakes Aquarium. 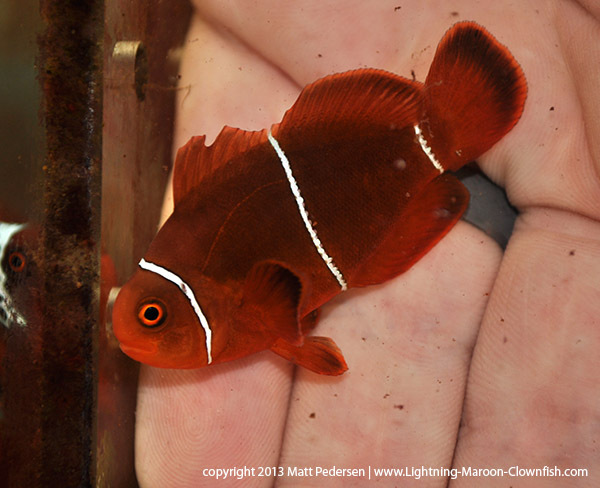 Written by Lightning Maroon Clownfish and Sibling Move to Great Lakes Aquarium – The Lightning Project about 6 years ago.